About six months ago I received a request to photograph a tombstone located in a small cemetery near my neighborhood. I, of course, looked up the cemetery because I’d never heard of it and I’d driven right by there to take my son to basketball practice and I didn’t remember seeing a cemetery. I thought to myself, “This shouldn’t be too bad. It’s a small cemetery.” I also thought I’d photograph all of it if it was indeed small. After all, I already had the transcription spreadsheet in hand. What could go wrong, right? When I will learn not to ask myself that question I’ll never know. Anywho, I went and searched for it. Drove right past it. [Of course] Turned around and slowed down at the empty overgrown lot that had a few trees. I parked and thanked God I’d put my graving outfit on –jeans, long-sleeved shirt, and Timberland boots. I quickly found the tombstone to fulfill the request, then started taking photos of each tombstone, methodically going through the spreadsheet and checking the peeps off. To my dismay, though, I found something kind of odd. There were tombstone transcriptions listed for some tombstones that I couldn’t find, and these were spouses of ones already there. Likewise, there were tombstones in the cemetery that did not appear on the list, and they weren’t new. And you want to know why? Well, I can tell you one thing. It’s not that these ancestors [not mine, someone else’s] were playing hide-and-go-seek. Perhaps the person who transcribed the cemetery had been distracted. Perhaps the grass and weeds had grown over some of the tombstones. And perhaps overgrown grass and weeds were the source of my problem now. Or perhaps the cemetery was haunted. Who knows? But most of the tombstones were old with a Civil War Confederate soldier buried there as well. Some of the older tombstones were becoming smooth with their names and vitals being worn away by time and weather. Now, if I’d been looking for one of those overgrown tombstones, I would’ve been out of luck because I don’t have x-ray vision. But what if there was a way to capture a tombstone’s exact whereabouts so that later on, even if it became overgrown with weeds, even if the inscription wore away, and even if the cemetery where it’s located looks like an overgrown abandoned lot as you drive by it? However, there is a stipulation. You have to be at the cemetery to create a memorial. After all, the whole reason it was designed is because the co-founder of RestingSpot.com, Brett Atlas, could not find his grandfather’s tombstone even though he’d been there before and he had a map. [And all gravers have been in that situation before, right? Frustrating.] So the whole point of this app is to record the GPS coordinates for the tombstone so that anyone can find it later no matter what, and you have to be there to do that with your handy dandy Smartphone. As genealogists, we’re always saying the best documentation is that which is created as close to the actual event that generated the documentation, right? Not the documentation that was generated three months after you digitally photographed a tombstone while eating a Krispy Kreme donut. And don’t even get me started if you enlist someone else to read those photographs that are three months old because you had to run up and get some more of those tasty Krispy Kreme donuts. I mean, we’re already far from the actual death and creation of the tombstone and now you’re gonna add another person to the situation to help you transcribe those photos of tombstones? Probably not a good idea. And notice that I said they’re transcribing the photos of the tombstones, not the tombstones themselves. So, I tried RestingSpot.com’s app this past weekend on the 2 family graves that I have near me here in the Houston area, and it worked like a charm. My Great-Aunt Anne, who was one of the brave women who volunteered for the Navy’s W.A.V.E.S. [Women Accepted for Voluntary Emergency Service] and drove an ambulance in France during World War II, has now been GPS’d. And being such a forward-thinking woman for her time, I gotta think she got a big kick out of me capturing her location, entering her vitals, taking a photo of her and her husband’s tombstone, and uploading all of the data to RestingSpot.com’s website with my handy-dandy iPhone. And? Yes, I’d already taken a photo of her tombstone previously, but it doesn’t hurt to go and visit again, right? To make sure everything is as it should be, right? To pay a visit to a woman who risked so much for her country? I’m not *that* busy. 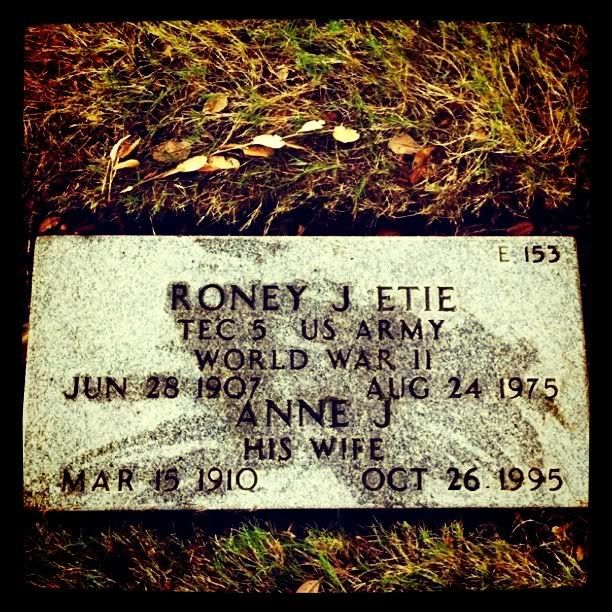 And the second family member’s tombstone that I visited this past weekend? The Jerk’s. 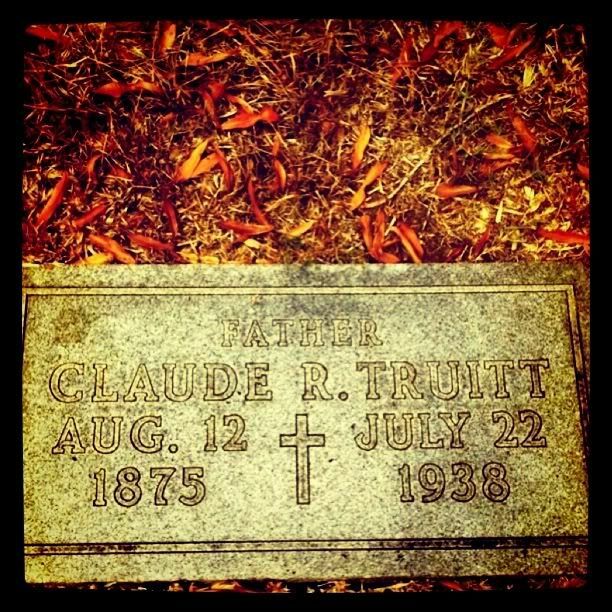 You know, Claudius RoyTruitt, my Gran’s dad? According to my mom, he was a jerk. Don’t know why she thought her grandfather was a jerk. But not knowing the “why” has never stopped me before from finding out someone’s story. In fact, it’s quite the opposite with me. And just in case my great-grandfather has any thoughts about him and his tombstone “disappearing” before I can find out his story, I thought it best to GPS the Jerk, too. He’s not going anywhere on my watch. [And, wow, the only thing that’s been passed down about him is that he’s a jerk. How sad is that?] Now? If anyone else in the family wants to visit the Jerk, well, now they can find him easily. There is also a map on the ancestor’s page on RestingSpot.com marking the location of their tombstone, and directions to it are just a click away. Want to share an ancestor’s resting spot? No problem with a click you can share it by email with others. Does it get any easier than this? Right now, no. RestingSpot.com’s Smartphone app is truly a wonderful addition to the genea-tech world. It combines simplicity and intuitiveness to make a potentially frustrating ancestor visit to the cemetery an enjoyable experience allowing us to write the family stories even quicker and more accurately while eating Krispy Kremes, of course. So go check RestingSpot.com out. Download their app onto your Smartphone and give it a whirl. Go visit some tombstones that you haven’t visited in a while. What are you waiting for? Go GPS your ancestors’ tombstones. Note: While I was asked to review their site and app (which are/were free), I received no compensation to do so from RestingSpot.com. This is my honest and unbiased opinion. For more about my disclosure statement on Family Stories, click here. Great post. Really enjoyed that. So it looks like I may have to check out this new software - sounds great. Thanks for the tip. Keep up the good work. Thanks to the information you've shared, this morning I learned that the app can be downloaded to an iPod Touch - I just purchased one so will download the app immediately. Thanks for sharing Caroline! Great review. very cool Caroline, I don't own a smartphone, but my husband does, won't he be impressed when I download this app to his phone. You go, girl! Thanks for the great post. I will have to give it a try! Well, CM, You made a convert --- well that is, when I get a smart phone. My phone is a dumb tracphone, but i am hoping the genea-santa will notice this little comment!! Might even get a graving outfit to match --- i do like to be color coordinated. Great article, Caroline. Glad you like it. Lucie, the app will not function properly on an iPod Touch or an iPad. Neither has true GPS functionality yet. As soon as they do, they'll be supported. We need to clear that up in the next description. Sorry about that. I am going back to Sharon next month and will be armed with the app AND wearing my graving getup. Thanks for highlighting this app. I get such a kick out of your posts! They're always so much fun to read! This app sounds great! I'm on my way to their website right now. I've got a 'droid and I think I'm going to need this! Thanks for the great info and post! Thanks, y'all. I'm glad you enjoyed the post. Brett~ Thanks to you for providing the app. It's awesome. Wonderful post! Does this mean that I now need to upgrade to a smartphone. For a similar app try billiongraves.com. I will definitely remember this for next time. Thanks for sharing! Great article, I wonder if it works for UK graves too? Presumably they must first be input using a GPS worthy camera? Will definitely explore this further. And thanks David for reading and commenting. I appreciate it!! This is very interesting. Amazing the things you can do with a phone these days!